Tonight celebrate Culture Night and those who make it. I was privileged to know, and have some of my work translated by, the magnificent Irish scholar, priest, poet, publisher and sage Pádraig O Fiannachta. His cultural breath still breathes on this great land of ours and its influence gives life throughout the cultural world. The text below is a translation from our 2006 work ‘Letting Go of That which you most Ardently Desire’ an artwork that dealt with the issue of armed struggle in Irish history and our recent decommissioning process. An tAthair O Fiannachta passed away in July of this year into the mythical. What is it like to walk away from conflict, to put your weapons beyond use? To dwell upon all the years committed to the never ending cycle of fright, fight, flight. Resentment, hatred, fury and denial all form part of the energy field that has dominated us human beings for thousands of years. The grip that binds us is a reflective process which offers participants a chance to engage with the emotional dynamics that underlie letting go and the emergence of something new. Bímid, mar dhaoine daonna, de shíor ar gor ar chréachtaí inmheánaithe, agus ag iarraidh bheith réidh leo. Toisc nach féidir linn, nó nach toil linn, fadhbanna áirithe a réiteach, is daingne fós ár ngreim orthu; cé go mbímid ag tnúth le síocháin, le suaimhneas agus le dul chun cinn, ní bhíonn ar ár gcumas, de réir dealraimh, scaradh leis an rud seo a bhíonn á bhagairt sinn a scrios. Conas a mhothaíonn sé cúl a thabhairt le coimhlint, d’airm a chur ó mhaith? Bheith ag cuimhneamh gan stad ar na blianta gan áireamh gafa ag sceon agus comhrac, tóir agus teitheamh, teitheamh agus tóir. Tá fuath agus fíoch, fearg agus faltanas i réim i ngarraí treafa polaitíochta Éireann leis na cianta cairbreacha. Ní hiad na hairm chogaidh amháin atá le cur ó mhaith agus le scrios ach freisin na mothúcháin úd go léir a nasc sinn, glúin ar ghlúin, le cogaíocht an ghunna – táid le scaoileadh go deo faoi dheireadh thiar thall. Is geall le cailliúint, le caoineadh, i gcónaí rud a scaoileadh uait. Tuigeann tú de réir a chéile nach féidir leat greim a fháil go deo arís ar an rud ar ar réitigh tú scaradh leis. Glacann tú leis de réir a chéile nach aon tairbhe duit é cibé scéal é. An glas-snaidhm a cheanglaíonn sinn, is próiséas meabhrach é a thugann caoi dóibh siúd a bhíonn páirteach ann dul i ngleic leis na fórsaí mothaithe is bonn don scaoileadh ar shiúl agus do shaolú na nua-bhreithe. 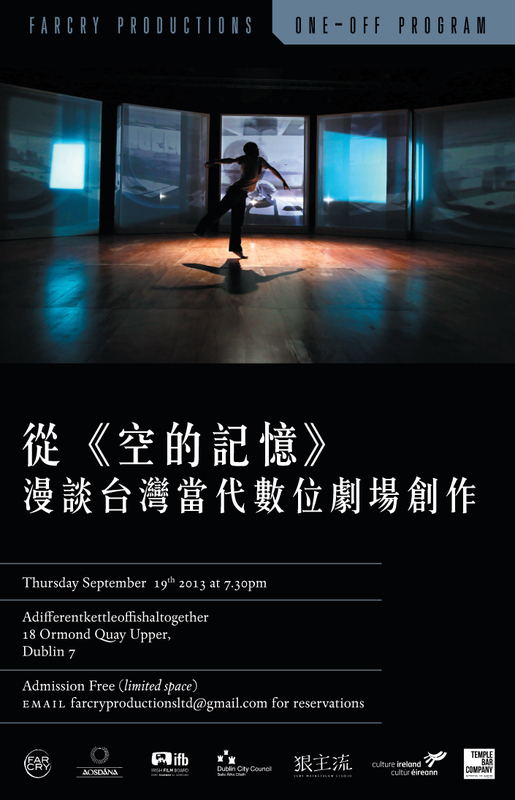 There will be a 20 minute film presentation of Emptied Memories Dance piece after which Chou, Tung-Yen will speak about the making of this work. Questions will be taken at the end of the presentation. Emptied Memories is the ongoing exploration into space and memory through theater and moving image that scenographer Chou, Tung-Yen has undertaken in recent years. In 2011-2012, under the sponsorship of Ministry of Culture, he invited the choreographer Chou, Shu-Yi to try to co-create an “empty space” by using “space” and “memory” as the core from which to start. The creation employs the technological integration of panoramic video, real-time image processing, sensors and wireless stage control system. The performer drives the external deformation of the material world, echoing the internal state, in order to present the organic flow of one’s mind landscape. In October 2011, it was presented in its work-in-progress stage and one year later premiered in 2012 Digital Performing Arts Festival. Now the voyage of Emptied Memories continues. “Precise images and body movements. CHOU, Tung-Yen holds a MA in Scenography with distinction from Central Saint Martins College of Art and Design in London and a BFA in Theatre Directing from TNUA. Currently a lecturer teaching in the School of Theatre, Taipei National University of the Arts, he is also the director of Very Mainstream Studio. 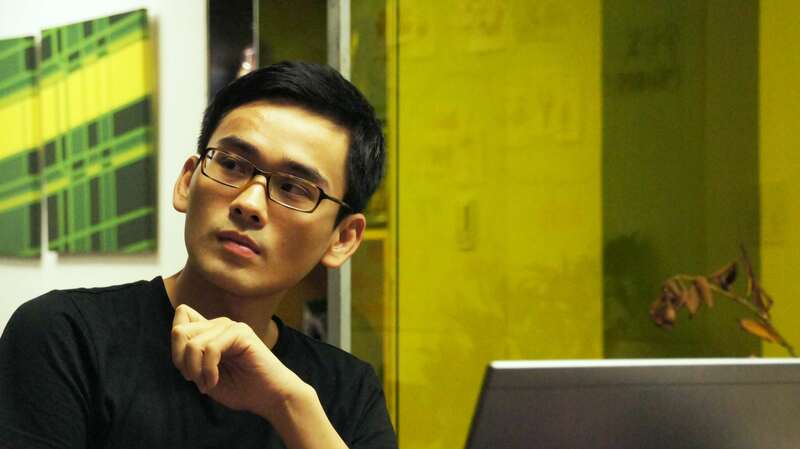 CHOU works mainly in film and theatre arts. His film and video works have been nominated and participated in various international film festivals. Recently he has collaborated closely as well as diversely with many of Taiwan’s performing arts groups (including Performance Workshop, Godot Theatre Company, Tainaner Ensemble, Flying Group Theatre, Shakespeare’s Wild Sisters Group, Taiwan Drama Performance, Dark Eyes Performance Lab, Scarecrow Contemporary Dance Company, Horse DanceTheatre, National Symphony Orchestra and Taipei Chinese Orchestra) In addition, CHOU has also done excellent work in interdisciplinary creative projects incorporating technology with performing arts.